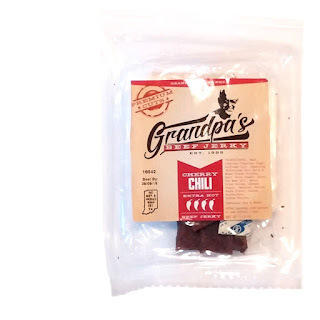 Grandpa's Beef Jerky is a brand started by Jacob Piercy, based out of Fishers, Indiana. Piercy remembers being a kid and watching his grandfather hanging deer meat for jerky. Eventually, his grandfather handed down the recipe and process. Today, Piercy sells packages of Grandpa's Beef Jerky at farmers markets across Indiana and online too, allowing jerky fans across the USA to enjoy a family legacy. This "Cherry Chili" is described as being made from, "Montmorency cherries and Thai chilies", and is marked as being, "Extra Hot". 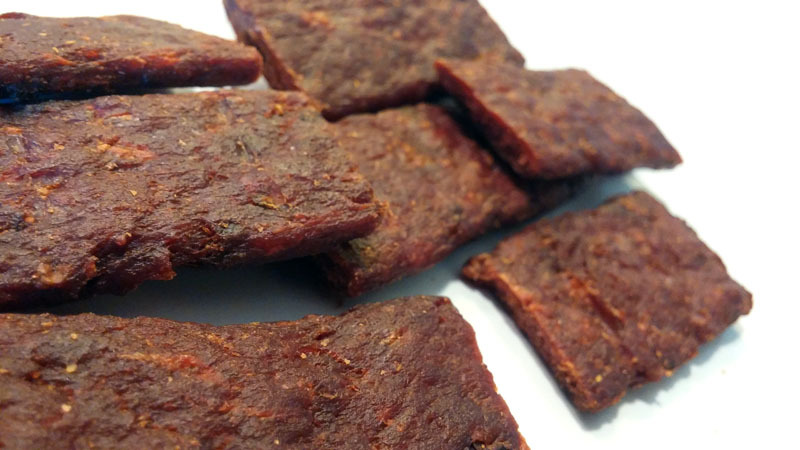 Beef, cherries, seasoning (hydrolyzed corn syrup & wheat gluten protein, salt, onion powder, spice, soy bean oil), water, dried cherries, cayenne pepper, dextrose, natural smoke flavor, sodium erythorbate, sodium nitrite. The first thing I taste right away is a light smoke, and hints of chili powder. 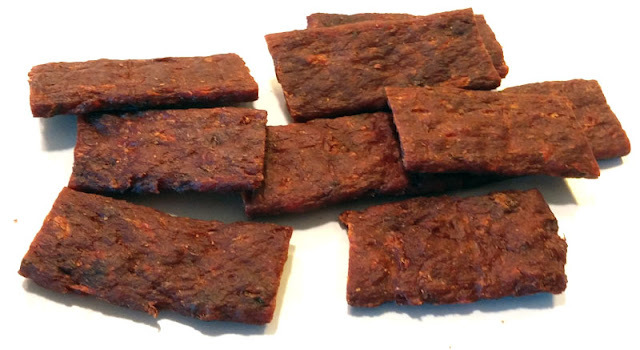 The chewing brings on more of the chili powder flavor, but with some salt and seasonings. There's a light bit of heat in the background, and touches of natural meat flavor. For being marketed as, "Cherry Chili" and as "Extra Hot", this holds up partially. I do taste the "chili" flavor, mainly as chili powder with some cayenne flavor. There is no cherry flavor to speak of, nor anything fruity, sweet, or even tart. It's not extra hot either. It does have a moderate level of heat, but nothing close to the high level of heat the packaging claims to offer. Otherwise, the primary taste profile is that of a salty, seasoned, chili powder flavor, with some cayenne pepper for flavor and heat. The meat consistency is chopped and formed beef, shaped into bite-sized strips. It has soft chew, comparable to the company's "Sweet Teriyaki", and still a meaty texture, but not exactly steak-like. This Cherry Chili variety from Grandpa's Beef Jerky sounded tantalizing with its cherry infusion, but I found no cherry flavor at all. It wasn't "extra hot" as the packaging claimed, but moderately hot. I still found a snackable flavor overall, but otherwise was left feeling disappointed that I couldn't get what I was promised with the cherry flavoring and the extra hot heat.